A completely new lenses sensation - give your tired, dry or stressed out eyes some tender loving care with ACUVUE Oasys 2 week contact lenses! Don't be distracted by irritated eyes - get on with what you want to be doing! Made from soft and light senofilcon A material ACUVUE Oasys 2 sit stably on the eye, providing constantly clear sight. This particularly comfortable material makes ACUVUE Oasys 2 the perfect answer for eyes that are often dry. Maximised oxygen permeability guarantees that your eyes will be able to breathe on long days and in extreme conditions. Working in front of the computer or in an air-conditioned office will be a breeze. A special wetting agent keeps the lens of the eye moist the whole day long. This way you'll be seeing clearly even in the most demanding situations. Like all ACUVUE lenses, Oasys 2 is equipped with UV protection and a simple to use handling system. With a light blue tint on top of that, you'll never struggle to put in your lens again! Find out how much you can save with the bundle offers on ACUVUE Oasys contact lenses and care solutions. 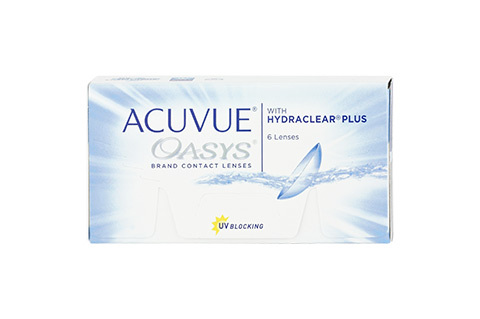 Mister Spex advises all online purchasers of ACUVUE Oasys contact lenses: the contact lenses, ACUVUE Oasys, should always be fitted to your eyes by an eye doctor or optician. The period between fittings, unless otherwise prescribed by an eye doctor or optician, should not exceed 6 months. You should go for regular check-ups. You should also strictly follow the recommended wearing time from the manufacturer Johnson & Johnson/your eye doctor/optician for ACUVUE Oasys contact lenses. It is your own personal responsibility to make yourself aware of the care instructions for ACUVUE Oasys contact lenses and to follow them accordingly. In case of eye irritation or visual impairments when wearing ACUVUE Oasys, remove the contact lenses immediately and consult an eye doctor or optician. Damaged contact lenses should be replaced immediately.